New building with old exhibits. 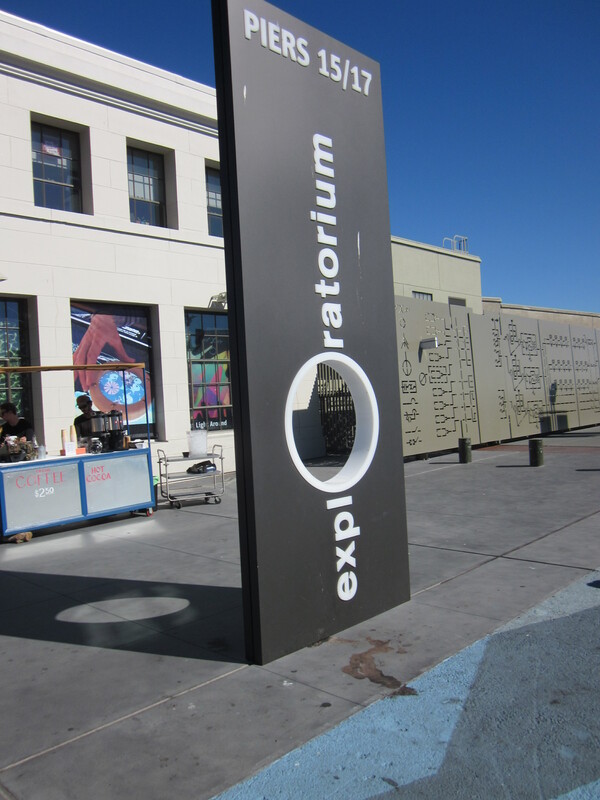 This weekend we headed to the new Exploratorium. Because the Bullitt is in the shop with broken spokes (sigh), we took Muni. That meant an unusual amount of walking for me, all the way from Embarcadero station to Pier 15 and back. 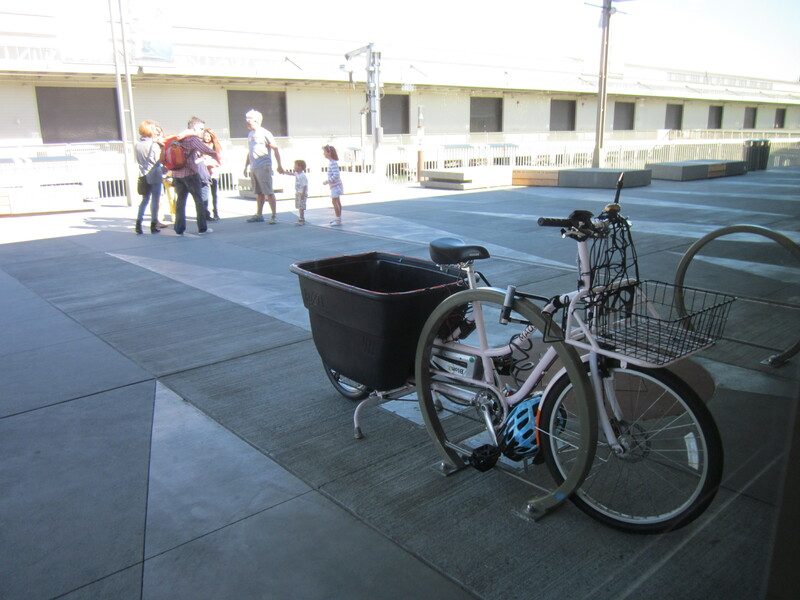 It would have been a much better day to ride, both because the weather was outstanding and because the Embarcadero bike lanes had been expanded for the weekend due to the America’s Cup. And it would also have been a better day to ride because I still can’t walk very far on my bad leg so I passed out in exhaustion as soon as we got home. Such is life. I have no stamina. Watching the traffic along the Embarcadero was fascinating, and because my kids are even slower and more easily distracted than I am, I had plenty of time to think about it. A while ago I read a fantastic book, Human Transit, which talked about how irritated drivers can get seeing “empty” bus rapid transit (BRT) lanes during car traffic jams. The perceived emptiness of the BRT lanes leads solo drivers to complain that these lanes take away capacity for solo drivers for no good reason. But as Walker (the author) points out, the “empty” BRT lane typically allows a fully-loaded bus to pass at least every five minutes, carrying 50-100 passengers apiece. Drivers see BRT lanes as “empty” because they are stuck in place, but their perception is flawed. Taking away the BRT would trade an hourly throughput of 600-1200 (at worst) people on buses for an hourly throughput of a few dozen people in automobiles (at best). Having the lane clear enough that buses whiz through uninterrupted is what makes BRT work. Of course, buses aren’t full all the time. However they are almost always full when traffic is backed up, and no driver cares how many buses are in a BRT lane if private auto traffic is moving quickly. If moving people around is the goal, then pretty much every street that ever has a full bus should have a protected BRT lane. At which point more people will want to ride the bus, which would further reduce private auto traffic: it’s a virtuous circle. Everybody wins! The city is now providing less traffic for solo drivers and quicker trips for transit riders. Yet because of the false perception that the lanes are always “empty” installing protected BRT lanes has been incredibly controversial. 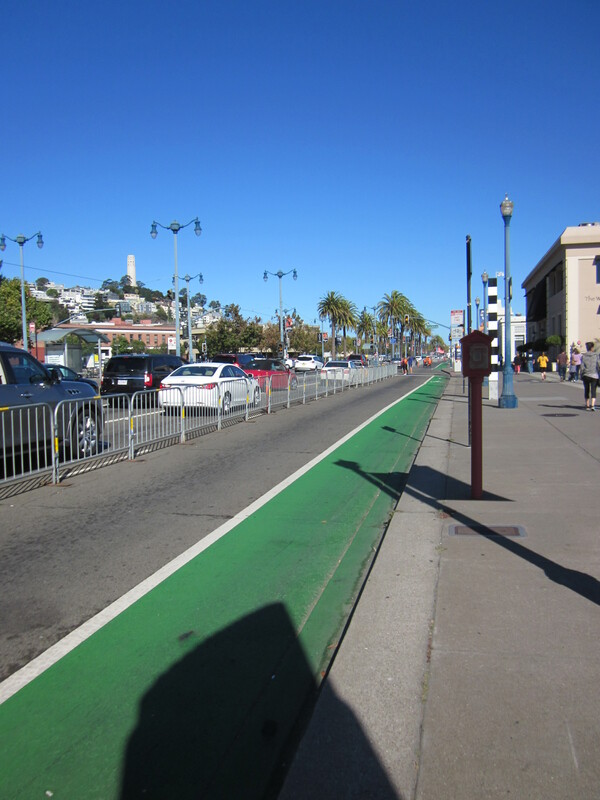 I thought about this as I watched drivers in cars fume in traffic on the Embarcadero, glaring at the usually-for-cars lane that had been removed to make a two-way (mostly) protected bike lane. 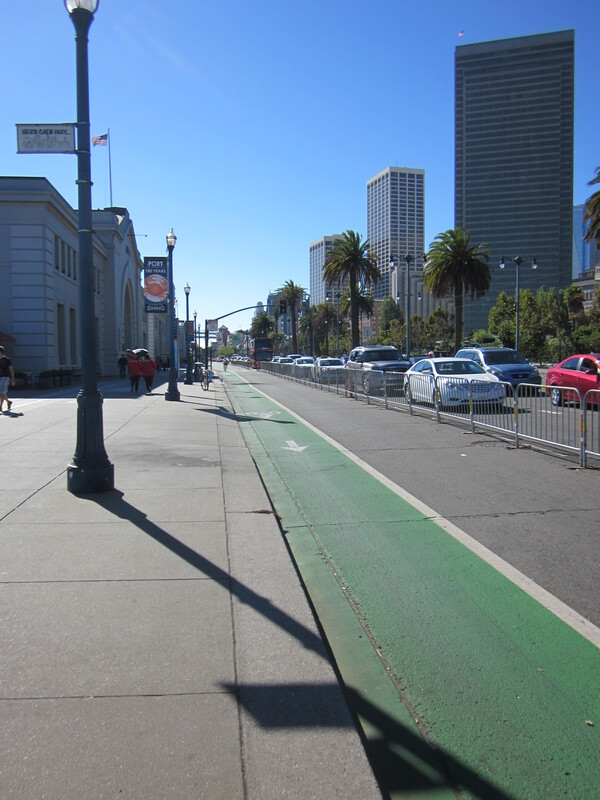 To people stuck in the abysmal auto traffic along the Embarcadero, the bike lane looked “empty.” Early in the morning, when we were there, a bike (or group of bikes) passed northbound roughly every ten seconds, though that’s an average—sometimes a minute would pass with no bikes, then there would be a handful, etc. 50 people in cars using 3 lanes vs.
150 people on bikes using 1 lane. And this was early in the morning—on the way back I gave up trying to count bikes because there were so many more of them in the lane by lunchtime. Car traffic was, if anything, more abysmal. This BionX Madsen was assisted by The New Wheel over a year ago and has its own Facebook page. The irony, of course, is that these incredibly desirable “empty” lanes are public. They’re available to anyone who wants to use them. 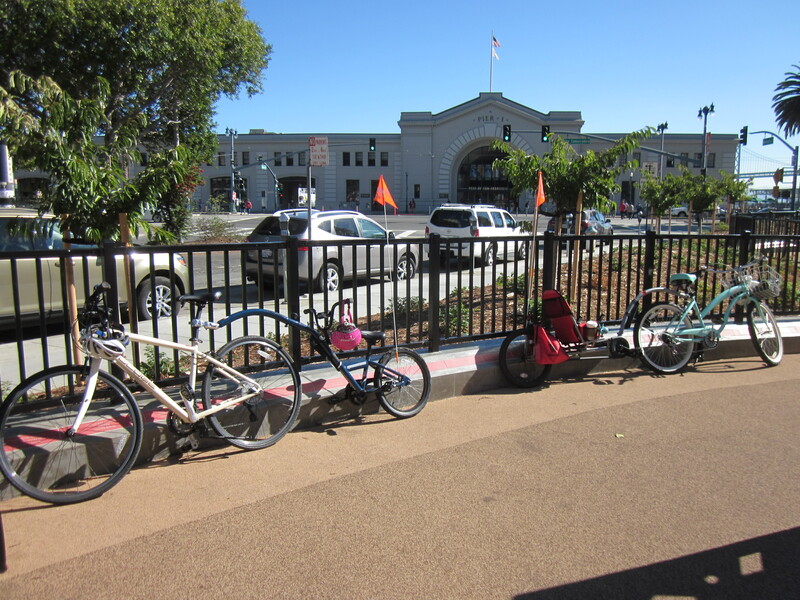 All you have to do is get on a bus or a bike—and if I can carry my kids on a bike even with a gimpy leg, and a senior on an oxygen tank can ride a trike while hauling his oxygen tank, and a man with no legs can hand-wheel his way along the same path, I have to think that nearly anyone can manage one option or the other. Really, the only way to take away the freedom to travel uninterrupted is to give that “empty” lane to cars. Thanks for this, HotC. I’m reminded of how many people are moved by Boston’s T whenever it breaks down (which is unfortunately all too frequent). You see the masses rise from the tunnels and wait for buses to shuttle them away— 5, 6, or more fully packed buses for a rush-hour train. Your observations/analysis are really important for urging policy makers to think outside the car. On the bicycle side: I regularly see 6-12 of us stopped at lights on the way home. Many others going the other direction, or crossing on perpendicular avenues. All of us passing autos waiting for traffic to clear. And yet the autos want us users of bicycles and buses and trains to get off the road… into cars! Ah yes, that makes a lot of sense. Awesome blog. Your posts have both steered me towards the Bullit and have led me to search for comprehensive bicycle insurance. Still deciding whether to gather the pieces and have a local shop build it for me or pony up to Splendidcycles. Things is… your Bullit is in the shop…again. First it was the FSA Metropolis Patterson crank and now a spoke failure on your Alex Supra rim. What gives? It’s just… we’ll you know how much I’m looking to drop on a kid hauling Bullit – If parts are disappointing IRL, I would totally appreciate your candid insight. Also, If you haven’t seen them, check out bike/ped TV series Perils for Pedestrians. Episodes 140 and 152 feature California. If I had to do it all over again, I would not get the Patterson crank–it’s not up to the heavy loads we put on it. That was a bad decision on our part, and we doubled down by replacing it once, instead of just accepting we’d made a mistake after the first failure. That cost us two long stays in the shop. The triple ring has been completely solid. I’d stick with that. Neither of these problems reflect on the Bullitt so much as they reflect on our choice of aftermarket add-ons (BionX, Patterson cranks). You don’t see these kinds of problems with a Workcycles Bakfiets, for example, because they’re all in one and heavy as lead with enclosed parts, but the cost of that kind of reliability is that the friends who just moved to our neighborhood never take their Bakfiets out of their garage because they can’t get it up the hill. We’re learning as we go, but overall we’ve been really happy with the bike. And what I write about here doesn’t always reflect our day-to-day experience. E.g. : Matt used the Bullitt to haul both our kids every single day this summer while I was zoned out on narcotics and bed-bound, up a pretty fearsome hill to summer camp, and during that time it did not fail him once. When it does what we need it to do, which is almost all the time, it hardly seems worth mentioning. I’ve been thinking I should write a one year update next month that gives some better perspective on this. And yes: I totally get what you mean about spending a lot on a bike and wanting it to work without disappointment. So definitely not a Patterson on a cargo bike! The spoke issue I would say reflects on local conditions. And finally: be careful with the BionX controller if you get an assist. Matt dropped it a few times and now the display is all messed up–it still works fine, but it looks like crap. If we replace it I think we’ll glue it into place.